I hear that Labor Day is unofficially the end of summer. Technically, we still have 16 more days until Fall, so let’s stay positive here. I don’t think anyone has told my tomato plants a thing about this because they are turning out beautiful, ripe tomatoes like crazy! (I’m not complaining, I’m thrilled!). If you’re lucky like me, you are probably trying to find a way to use up all your end-of-summer tomatoes. 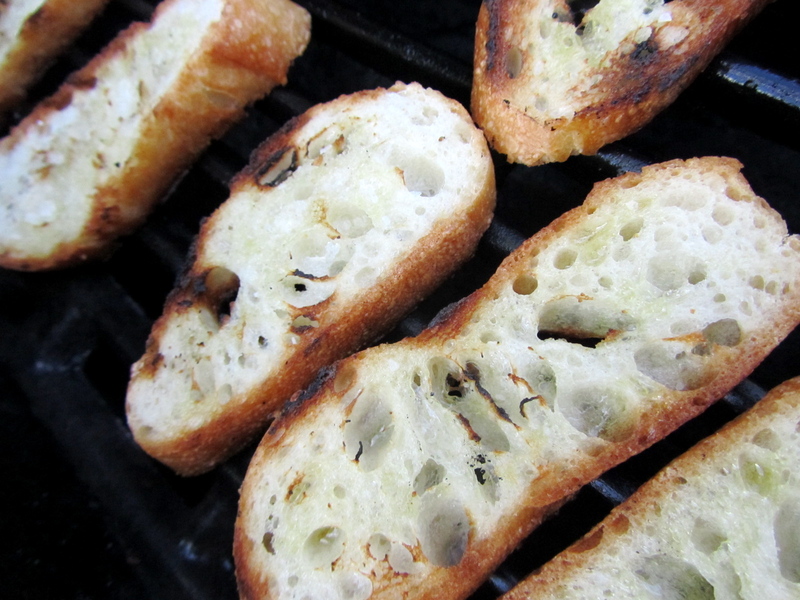 These crostini has been one of my favorite picnic recipes this summer. 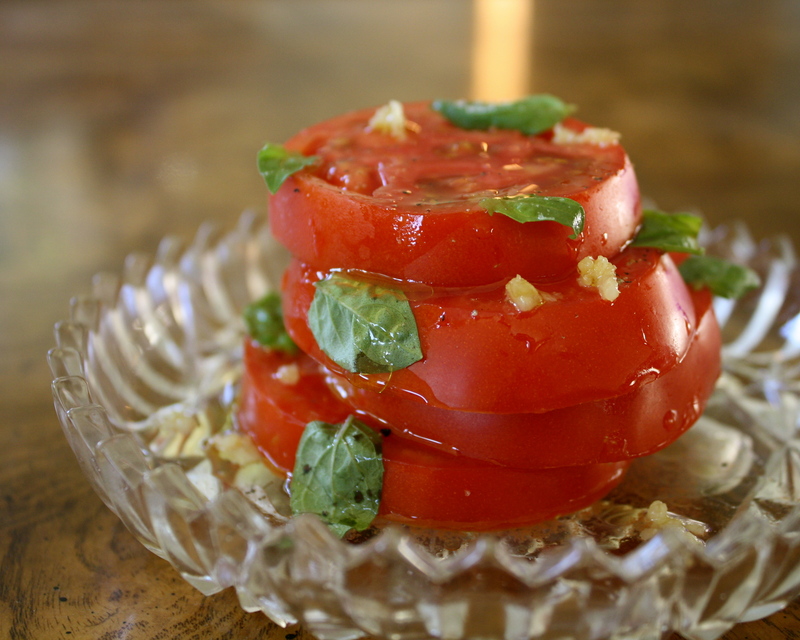 They are easy and pretty quick, but still tasty enough to seem like a treat, especially if you are using home grown or farmer’s market tomatoes. The smokey grill flavor makes the crostini extra-special, so I would recommend grilling if you can – but I did include the how-to for preparing the crostini in the oven. Now go enjoy the last of the summer produce and weather! Wow, so time flies/disappears when you work three jobs. I haven’t posted since the 16th! I am so sorry, dear readers….I’ve been busy pouring wine, eating cheese, chasing around an adorable two-year-old, writing newsletters, and sending out press releases. Three jobs, two college classes, and I love it all. This means I’m happy but tired. Most days, I come home ready to crawl into bed and snug the dog. On the days when I feel motivated, it’s usually because I have pizza and wine on the brain. Oh yes. 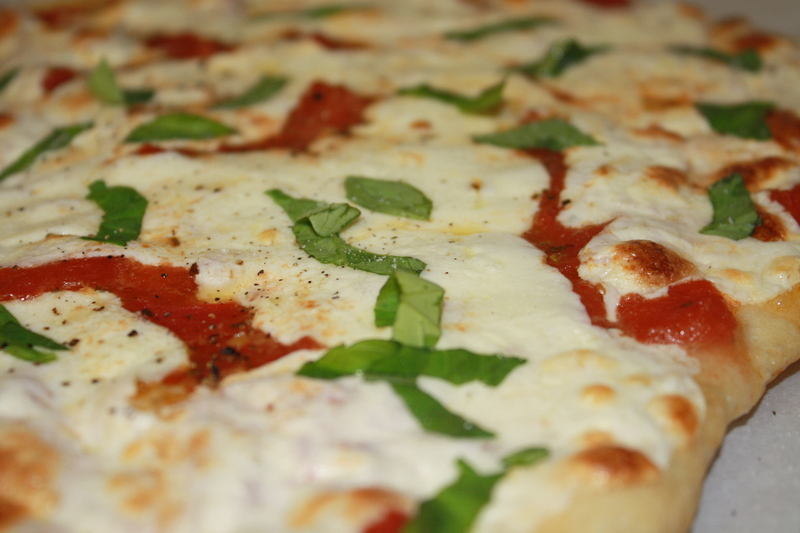 Nothing beats a homemade pizza, straight out of the oven, paired with a fabulous wine. 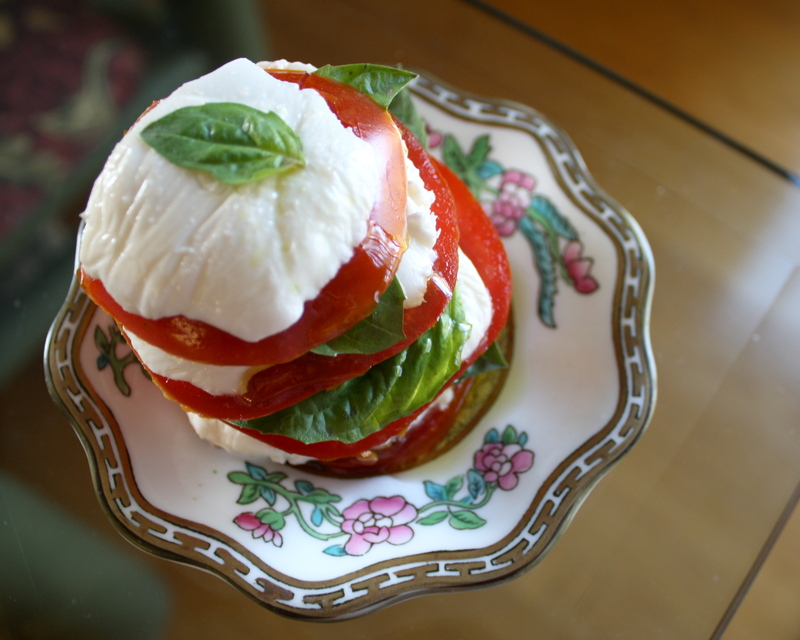 I know making a Caprese Salad is probably nothing new to you. There are probably millions of recipes just like this; I know you’ve seen probably 6,000 photos that look just like these. 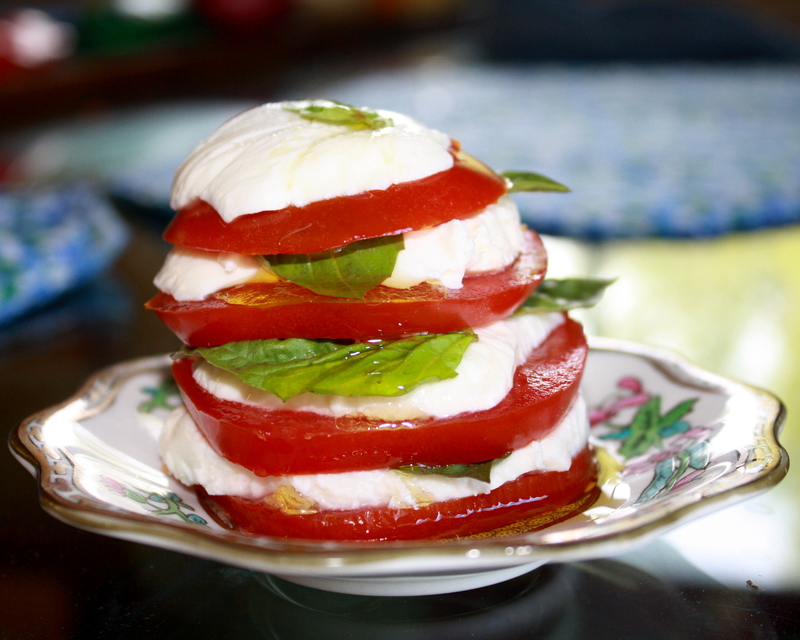 Let us not forget that Caprese Salad is a perfect light snack. It is a perfect summer appetizer. It is a perfect sandwich filling, spread out between a nice loaf of crusty bread. It can be chopped. In its skewered cherry tomato and Ciliegine (cherry-sized) mozzarella form, it becomes the cutest appetizer ever. It can fill a small dish or an entire bowl. It is healthy – tomatoes and olive oil are wonderful for your body, and fresh mozzarella is low-calorie and low-fat compared to many cheeses. You get the idea – it’s versatile, and I’ve never met anyone who didn’t like it. Let’s begin. My boyfriend, Brian, just moved into a new house-his first without roommates! It’s an adorable one bedroom with a teeny kitchen and a tiny bathroom. It has a little porch out back and a gigantic, fat palm tree out front, which I’m completely in love with (Christmas lights come December, anyone?). Last night, I brought over everything it takes to make this dish – from the pot and knives to the Parmesan and herbs (he’s not completely moved in yet). It was very exciting to play house…only it’s not pretending because it’s actually his house! Oh my goodness. Brian had fun watching me chop things and I enjoyed watching him clean up my mess; we ate at his coffee table and it was all very precious. 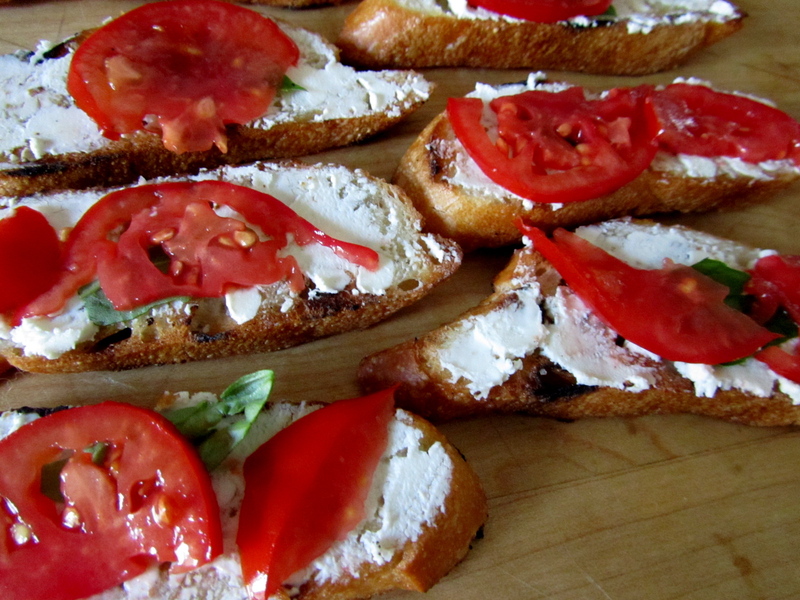 You might argue that bread is what makes bruschetta – actually, I wouldn’t dispute that. However, sometimes, when you’ve been baking many delicious treats…containing lots of delicious butter, sugar, and flour…you realize you might want to cut back or you’re going to end up with a belly. I won’t name any names. 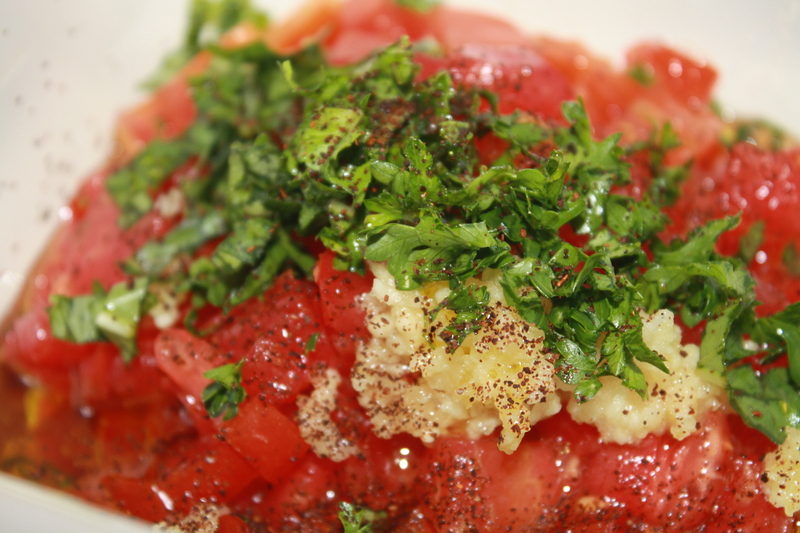 Technically, this should be called a tomato salad. But who wants to get technical? This recipe is a way to get all the flavor of bruschetta without any of the guilt or empty calories – just the healthy stuff! 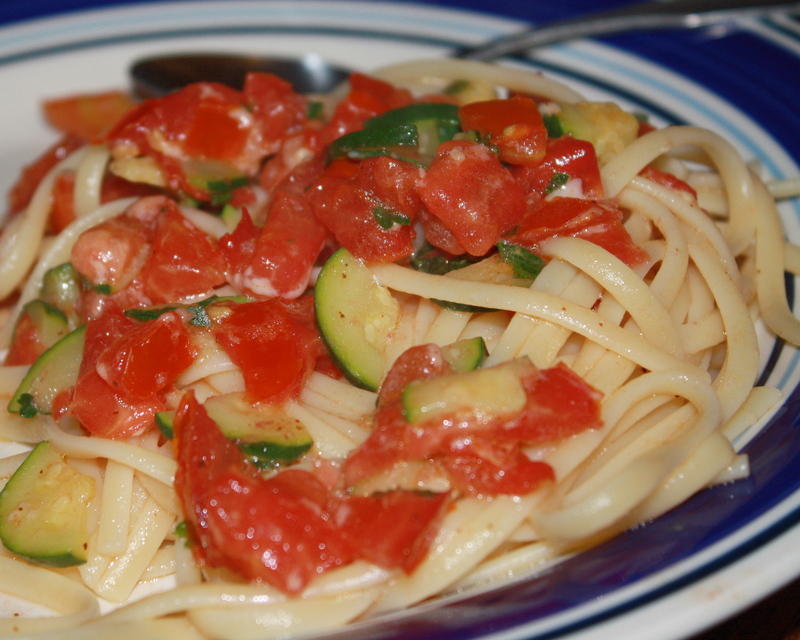 Also, it’s a great way to use up the delicious tomatoes that are probably abundant in your garden right about now. It only takes about five minutes to make!